The best favor you can ever do for you skin is to learn to work with it rather than against it. It’s one of the first mistakes people with oily skin make when they’re treating blackheads and other blemishes. If you’re anything like me, you went straight for the most drying products you could find in your efforts to control the oil on your skin. I’m sure you got the same results I did however: it made it worse. As it is with anything when it comes to oily skin, moderation is key. 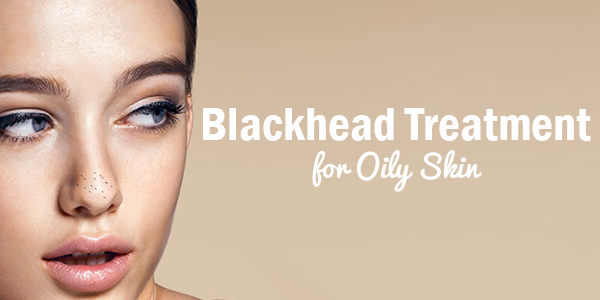 So then the question becomes, what is the best blackhead treatment for oily skin? Of any of the skin types, oily skin has to be religious about it. Twice a day. You can set your clock by it. The key here is to remove the excess oil from your skin without actually stripping your skin dry. If you wash too often with oily skin, you’ll actually cause your skin to product more oil. So the key will come in determining what product to use. The choice in products will depend on how sensitive your skin is. Ultimately, you would want to use a cleanser with glycolic acid in it such as this. This will get rid of any extra oil on the surface of the skin only, but will also help exfoliate and unclog your pores. It’s an all-round product good for blackhead treatment. However, some will find the product a bit too harsh for their skin. If you have sensitive skin, you may find a gentle daily cleanser will work fine for you. I use one myself, but find I sometimes will have to follow up with an additional astringent at night to help remove any additional product building if I’ve been wearing makeup. Another alternative is to use a water soluble light oil cleanser. If you have rosacea, you may find using a zinc based cleanser a better bet. For oily skin, remember moderation is key as with cleansing. You shouldn’t do it more than once a week. Any more than that and you run the risk of causing your skin to wan to produce more oil. Funnily enough, for those with oily skin exfoliating can actually be quite drying if done too often. As for product choice, you want to choose a product that helps break debris and other impurities. Anything that helps absorb oil will also be beneficial to you, so long as it’s not a drying ingredient. Looking for products with charcoal or oatmeal, both of which help absorb oil. My suggestion would be the Rapid Detox Charcoal Exfoliant. Masks are a great treatment for anyone with blemish-prone skin, but for those with oily skin it can be heaven sent. Masks help heal the skin, absorb oil, clear the pores, and tone the skin. Ideally, it’s also a product you shouldn’t use more than once a week. In fact, you can use it after you exfoliate to get the best benefit. If you use a facial steamer, which helps open and unclog pores, using a mask afterward will help enhance the benefits you get from it. The choice of mask really comes down to your skin type. Some masks are better for those with sensitive skin than others. French Green Clay is excellent for oily skin. It’s highly oil absorbent, tightens pores, and reduces redness. It can cause irritation, so it’s not for those with sensitive skin. Moroccan Red Clay is another good choice for oily skin. It’s a good choice for those with textured skin from blackhead breakouts. It’s also considered the best one for helping to get pull blackheads out. For those with adult acne, it can help improve skin tone. Its supposed to be good for treating eczema, and so is potentially one to try if you have sensitive skin. However as with anything, test it in a small patch to be sure. If you’ve got extremely sensitive skin, you might try Kaolin White Clay. This one helps reduce oil production, unclog pores, and remove excess dead skin. The benefit to this one is it will also help heal your skin if you need a bit of extra healing with swelling, pain, and reduce scars. For a more detailed reviews of all these masks, check out this article of mine. Without a prescription, the best topical treatment for blackheads on oily skin is probably salicylic acid. It sends oxygen down deep into the pores to correct abnormal shedding of skin cells. Basically, it helps to unclog your pores. You can even try a natural alternative to that by mixing 3 tablespoons mint (which has salicylic acid in it), with 3 tablespoons apple cider vinegar. You would add that mixture into an 8 ounce jar of water. You’d need to keep it refrigerated of course, but this makes an excellent topical treatment when applied nightly with a cotton pad. The problem is some people are sensitive to salicylic acid. Benzoyl peroxide is another option. This one works by destroying the bacteria that might be in the blackheads directly. It can be drying if you overuse it, so be careful with this one. It’s more traditionally used on those with acne and whiteheads, it’s effective on blackheads if used regularly. I will only give you one word of caution about topical treatments, and in fact consider it a topical treatment option. Oily skin can easily get out of balance if the body thinks it’s getting too dry from some treatment or another. Any time you clean your skin, exfoliate, do a mask, or apply a topical treatment, you need to balance it with moisture. Think of it in steps. On a daily routine: cleanse, moisturize, topical treatment. On your weekly routine: cleanse, exfoliate, steam, mask, moisturize, and topical treatment. Moisturizing is an essential step in the process for those with oily skin. If your body thinks your skin is too dry, you’ll actually end up producing more oily skin. Choose something light, and oil-free. Anything water based is usually fine. Often times it doesn’t even feel like you’re applying anything at all, but believe me you’ll notice a difference in the clarity of your skin.